Fast food workers in the UK are joining a one-day international protest for higher pay, just days after mainstream British politicians promised modest rises in the legal minimum wage. Thirty protests are taking place across the country according to campaign group Youth Fight for Jobs, and are inspired by Fight for $15, a movement for higher wages in the US. Workers are demanding a £10-per-hour “living wage” and an end to zero hours contracts, which do not guarantee employees a minimum number of hours. The action comes days after Britain’s political parties issued pledges for modest increases in the legal minimum wage. Labour pledged to increase the minimum wage, which currently stands at £6.50 per hour for those aged 21 and over, to £8 per hour by 2020. The Conservative Party has also promised to raise it to £8 per hour by 2020, and also to increase the tax-free personal allowance to £12,500 in the next parliament. Only the Greens and the TUSC have pledged a £10 minimum wage, with the Green Party intending to bring the increase in gradually over five years and the TUSC promising immediate implementation. Ian Hodson, National President of BFAWU, joined activists at the McDonald’s branch in Marble Arch. Hodson described the protest as a “good turnout” from a variety of different groups. Helen Pattison, 23, volunteered to speak to McDonald’s workers about the protest. A former zero-hour contract worker at a British pub chain, Pattison knows first-hand what it is like to live on low wages and in economic uncertainty. She told RT the McDonald’s manager allowed her to speak with the workers one at a time, for a few minutes each. The manager remained present during the conversation and within earshot. “People looked a little nervous but also definitely interested,” she said. 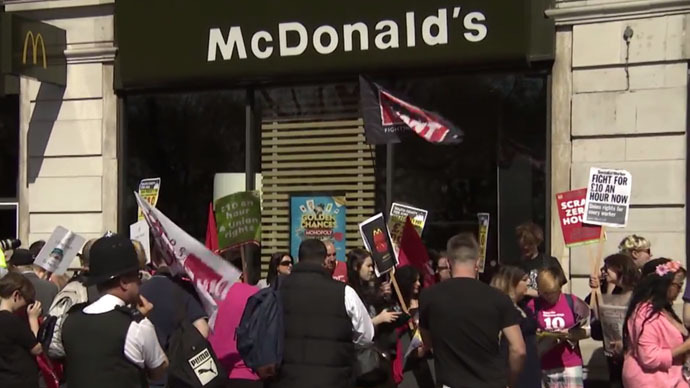 Pattison, who is involved in Unite the Union’s ‘Fast Food Rights’ campaign, explained to staff that the protest was against McDonald’s management, not the workers. McDonald’s is the largest fast food chain in the world, serving 70 million customers a day, more than the population of the UK. The burger giant employees 1.7 million people at 35,000 branches around the globe. Ian Pattison, an organizer for Youth for Jobs, said he hoped the demonstrations would encourage workers to join a union. Speaking to RT, Pattison said the British protests were organized in solidarity with the 60,000 fast food workers on strike in the United States. He added that around 50 demonstrators were involved in the protest outside McDonalds in Marble Arch from 10.40am BST. Pattison explained that only a few of the protestors actually worked in the fast food business because many are afraid of losing their jobs if they join. Like other organizers, Pattison is inspired by the Fight for $15 movement in the US. He cited Kshama Sawant, a self-proclaimed socialist who sits on Seattle City Council, as an example of what can be achieved through mass action. Sawant led the “$15 Now” movement, which culminated in the Seattle City Council raising its minimum wage to $15 per hour at the start of April. Wednesday’s protests are in solidarity with the Fight for $15 movement in the US, which has called a day of mass mobilization to mark the date US tax returns are due - April 15. Fast food employees are staging walkouts in cities across the country, including Detroit, Los Angeles, New York, St. Louis and Kansas City. Strikes are also taking place to demand higher wages and to raise awareness about the number of fast food employees who are forced to rely on government subsidies to get by. More than 52 percent of fast-food employees in the US depend on public assistance to make ends meet, according to a recent report by the UC Berkeley Labor Center. Solidarity strikes and protests are taking place around the world, with actions in Japan, New Zealand, India and several European countries. Liane Groves, head of Community at Unite the Union, said the enormous popularity of Fight for $15 has given new life to the movement for better wages in the UK. “Unite is following this innovative organizing model with a view to replicating this in the UK,” she added. Wednesday’s protest will continue at 5.30pm outside McDonald's on Whitehall, in the center of London.